I'm a little behind in my blogging. The house is quiet now. Just a few hours ago, the sewing machines were buzzing, and the house was full of our final last push to get our weekends worth of sewing quota done. I had my nose to the machine sewing, and I didn't get any pictures, but my sister did, so I'll let my sister blog about our efforts. I can tell you one thing, I'M POOPED, but so glad to have a new much shorter to-do list. This past week was full of exciting things. We attended the Barkers Point School BUGZ concert. I loved the concert and how confident the kids are at performing. We had baby Aurora over for a visit and she gets funnier and funnier with every visit. If you say, "Did you Toot?" She laughs, and thinks that's so funny. We think it's funny too. 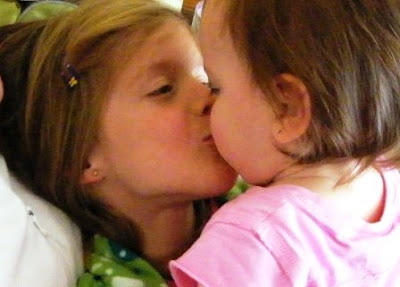 Here she is giving Grace many many kisses. 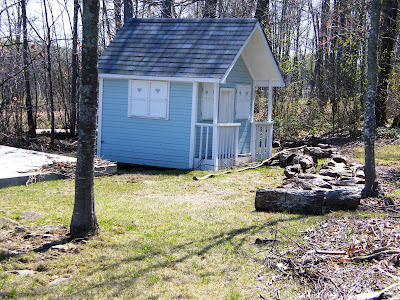 We got to our cottage and did Phase I of opening the cottage. That means, dragging dry good to the cottage, starting up the fridge, wiping out the cupboards, washing the windows, putting up the good curtains, washing out the fridge, sweeping and vacuuming out the dead bugs around the windows, and starting up the water pump. Well, the very last step, starting up the water, revealed 3 pipe breaks in the cottage and one outside. Nothing major that a local plumber couldn't fix within a couple of days. Phase II was yard work. The annual spring flood left a line of debris, and our wood pile in a straight line across our property. You can see that the wood pile settled right in front of the kids cottage. 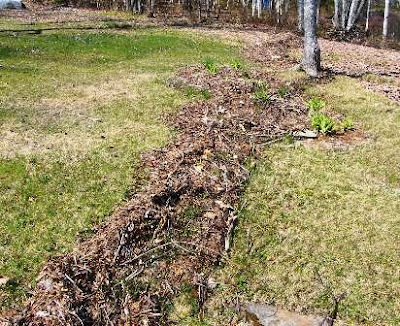 The second picture shows the flood line of lake litter that goes smack through my favorite little garden. The lily's are poking up through the litter. Thanks to the help of family, this is now all cleaned up. My friend Linda H. gave me some hostas for my shade garden and they all got planted and I can't wait to see them next week when they start to unfurl their leaves. We're looking forward to the the final phase III of cottage opening, which is making beds and scrubbing floors and filling the fridge with summer refreshments. Then let the relaxing begin. Well if you would move to the lake full time like I did (full time meaning I DO still work for a living) then you never have to go through that horrendous grand opening cleaning frenzy - it's just the normal day to day stuff.